Music Workshop and Concert with Windborne! The internationally renowned folk band, Windborne, is coming to the Lyme School! They'll be conducting a 2-day workshop on October 16th and 17th. Windborne will teach each grade and perform from their repertoire of songs from around the world. Windborne studies the authentic vocal styles of singing traditions from Corsica, South Africa, the United States, Bulgaria, Georgia, and more. The group has toured nationally and internationally to 4 continents teaching music, and is excited to bring their talents to Lyme. Students will learn harmony singing, as well as dancing, singing games, and more. On Tuesday, October 16th Windborne will be performing at the newly renovated Fairlee Town Hall at 6:30 pm. Lyme students in grades 5-8 will be invited to sing a song at the concert! Windborne is a truly phenomenal group and their live performances are incredible. Tickets at the door are $10 for adults and $5 for students. Windborne is Lynn Mahoney Rowan, Will Thomas Rowan, Lauren Breunig, and Jeremy Carter-Gordon. All four have traveled extensively in the US and throughout the world with Village Harmony, Northern Harmony and the Renewal Chorus, leading workshops and giving concerts. 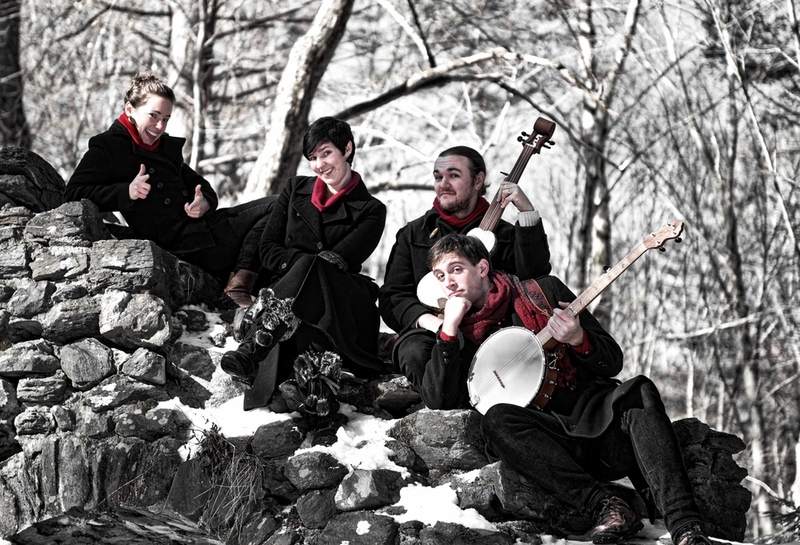 Windborne has toured New England several times, and in 2010 their vocal agility and power won them first place in Young Tradition Vermont‘s Showcase Competition. Since then, they have appeared at the Flurry Festival, the Shelburne Harvest Festival, the Young Tradition Vermont Reunion Concert, and have taught master classes at Keene State College. In January 2014, AMA sent Windborne on a month-long tour to Turkmenistan, Kyrgyzstan, and Angola performing and teaching as musical ambassadors for the US! Specializing in close harmony singing, the quartet has a vibrant energy and a strong connection, which is evident in their engaging performance. They educate as they perform, telling stories about the music and explaining the characteristics and stylistic elements of the traditions in which they sing.